Erect, often spindly, shrub or tree to 2 (–3) m high. Bark smooth, brown. Branchlets compressed, angular, orange or yellow towards apex, later reddish, glabrous. Phyllodes erect, narrowly elliptic to linear or narrowly oblong-lanceolate, straight, 6–14.5 cm long, (3–) 6–12 mm wide, thinly coriaceous, the minor nerves 2–4 per mm, parallel, rarely anastomosing, hyaline, with stomata visible between nerves, the midnerve raised, excentric towards base; gland 1, basal, minute. Spikes 2–3.5 cm long, interrupted, cream-coloured to pale yellow. Flowers 5-merous; calyx 0.7–0.9 mm long, dissected to 1/2–3/4, fimbriate; corolla 1.5–2 mm long, dissected to 3/4, glabrous; ovary densely pubescent. Pods pendulous, cultrate to linear, abruptly tapered at both ends, mostly flat to subterete when dry (terete but drying subterete to depressed), 4.5–12.5 cm long, 4–7 mm wide, woody, dark to blackish brown, often with paler margins, glabrous, opening elastically from apex. Seeds longitudinal, narrowly oblong, 5.4–6.5 mm long, black, dull, pitted; areole open; funicle running along and past one side of seed. An uncommon species occurring in the N.T. and north-western Qld, also from the Great Dividing Ra. near Torrens Creek southwards to 145 km N of Clermont. 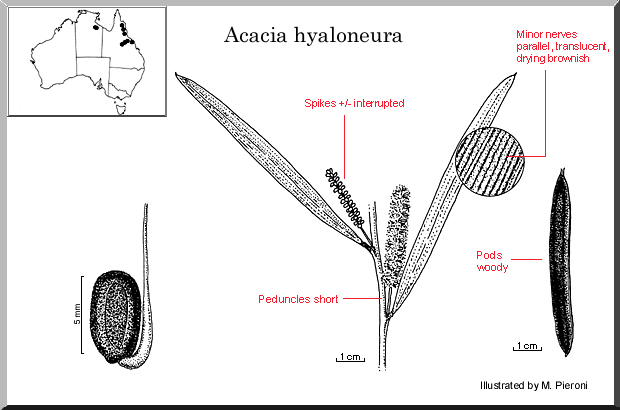 Grows in Acacia or eucalypt communities, on ridges and slopes, in clayey, sandy or rocky soils, on laterite and sandstone. Flowers recorded Dec., Jan., May–July. Differing from A. subtilinervis in the longer, interrupted, few-flowered spikes in pairs in the upper axils. 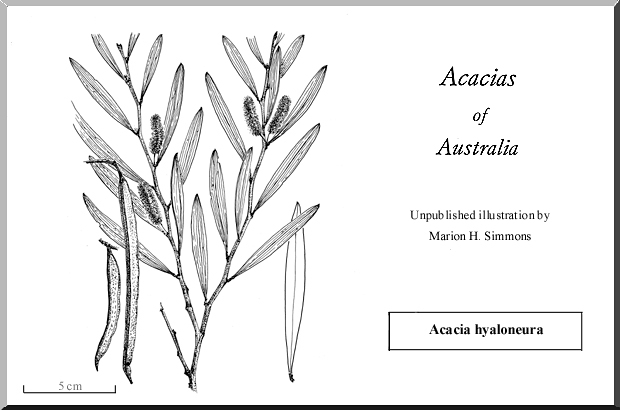 Acacia hyaloneura resembles A. whitei in general appearance. 21 miles [34 km] from Pentland towards Torrens Creek, Qld, Aug. 1972, C.H.Gittins 2523 ; holo: BRI; iso: NSW. Racosperma hyaloneurum (Pedley) Pedley, Austrobaileya 2: 350 (1987). Type: as for accepted name. N.T. : Mallapunyah Stn, I.D.Cowie 1683 & C.R.Dunlop (BRI, DNA, NSW); 60 miles [96 km] NE of Creswell Stn, R.A.Perry 1665 (CANB, NSW). Qld: Mt Mulligan, J.R.Clarkson 5863 (BRI, DNA, K, MEL, NSW, PERTH, QRS); c. 25 km SW of Pentland, L.Pedley 4818 (BRI); c. 22 km NNW of Yarromwere Stn on Great Dividing Ra., R.J.Henderson 2812 et al. (BRI).